One week before the Silvertip Pipeline burst and then bled into the Yellowstone River, Brian Schweitzer met with representatives from ExxonMobil regarding the Kearl Module Transportation Project, or “megaload” shipments. Although we have no way of knowing the full content of their conversation, it is reasonable to assume that the discussion involved the details of the project, repeated assurances of its safety, and a feeble request by the Governor that the shipments be built in Montana rather than abroad. Days later, as the Silvertip Pipeline gushed oil into the longest un-dammed river in the lower 48 states (some of that oil, as we have recently learned, coming from the Alberta Tar Sands, unbeknownst to regulators), Schweitzer promised that the Keystone XL Pipeline, a project for which he has continuously offered his unwavering support, would be different, that it would be more technologically sound, that the companies would be more honest, more transparent. It seems to have become a mantra: Next time. Next time it will be better. Next time things will be different. Exxon Valdez, Deep Horizon, Silvertip: these types of accidents will never happen again. Yes, it’s true that the first Keystone pipeline has leaked like a sieve–12 times in its first year of operation—and it’s true that if the Keystone XL burst it could dump 6.9 million gallons of toxic hydrocarbons into the same river. But no need to worry: Next time will be different. There’s something extremely crude, as it were, about the mantra of “next time.” There’s something blatantly disrespectful about telling people whose homes and fields have just been turned into oil slicks that next time things will be different, that even though we have yet to recover from the devastation of the spill, we should simply move forward with new and significantly more dangerous projects. As we write, news reports are surfacing of another pipeline leak on the Blackfeet Reservation near Cutbank, MT. On Saturday, a BP oil pipeline on Alaska’s North Slope ruptured, spilling up to 4,200 gallons of oil-containing fluids, mainly methanol, into the Alaskan tundra. Brian Schweitzer’s support for the Keystone XL Pipeline is reckless at best. It is a foolhardy gamble with the land, lives, and livelihood of Montanans who have nothing to gain and everything to lose. So how then do we reach our politicians in a way that is meaningful? How then do we leverage power? We could request a meeting. We could allow ourselves to be schmoozed and politicked by someone leaving office next year. But in the end we still wouldn’t have obtained the leverage needed to make a real change. Legislative, litigative, and public protest are all integral components in any successful campaign to change public policy and build collective power. The Capitol protest and occupation organized by Earth First! and Northern Rockies Rising Tide was an attempt to expose Schweitzer’s two-faced attempt to publicly chastise Exxon and quell the anger of Montanans while simultaneously supporting the XL Energy Pipeline and Exxon’s Kearl Shipments. It was an attempt to demand that he take a stand against projects that are so clearly bad for Montana, that are so clearly prone to disaster, and that are brought to us by companies that are so clearly invested in nothing but their own profit margin. Schweitzer is now in the national spotlight telling people that he will work his damnedest to make Exxon clean up their mess. But where was he last year when Exxon decided to protest their state taxes, leaving the Lockwood School in Billings no choice but to cut their budget and thus their staff. The July 12th occupation of the Governor’s office succeeded in drawing national attention to the fact that Schweitzer is still in bed with ExxonMobile, regardless of his make-things-right stance on the spill. Unlike some of the local coverage, the national media chose to focus on the links between the Governor, Exxon, and the Keystone XL pipeline rather than on comparatively trivial matters like antique tables and Scott Joplin tunes. The protest was rowdy but respectful. According to the Helena police, there was absolutely no damage done to the capitol building, which was left spotless. We made a sincere attempt to have a serious conversation with Schweitzer, but were repeatedly refused this opportunity. (One of many examples: Protestor: “…when 21 women try to have children in a community and 19 of them that year have stillbirths, I say, sir, it’s time for us to step asside from those corporations, to stand away from those people who would kill in our name for greed alone . . . well, where are you going to stand?” Governor: “Well, I’m standing here right now”). We recommend that people take the time to watch the raw footage available online of the meeting between the protestors and the Governor and see for themselves how Mr. Schweitzer behaved in response to direct questioning. Loud, vibrant protesters may turn some people off, but they serve a purpose. They draw a clear line demarcating where public figures stand on certain issues. They force people to respond, even if in the negative, and in the end what the people of Montana have learned (or at least should have learned) from the Governor’s response to our demands, is that our supposed “public servant” would sooner bow down to the interests of the largest corporations on Earth than stand up for the land, lives, and livelihoods of Montanans. We find that attitude to be disrespectful and crude. 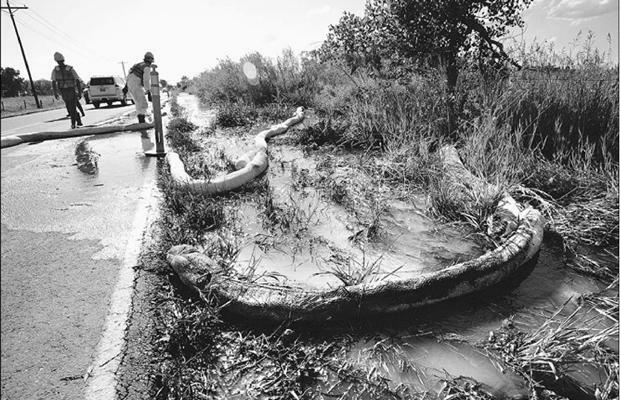 Pipelines Spill, Exxon Kills! Big Oil Out of Montana! On the morning of July 12th, six activists from Earth First! and Northern Rockies Rising Tide occupied Governor Schweitzer’s office in an act of non-violent civil disobedience. The activists locked their arms in a mock oil pipeline made out of PVC plastic pipe. In the wake of the Silvertip spill, Governor Schweitzer has publicly chastised ExxonMobil for their negligence and lack of transparency, while at the same time continuing to promote the construction of TransCanada’s Keystone XL pipeline, Exxon’s megaload shipments bound for the Alberta Tar Sands, and other extreme fossil fuels projects throughout the state. Governor Schweitzer eventually agreed to meet with the activists, responding to their questions with evasive and irrelevant pleasantries, but later declined to continue the conversation and refused to meet their demands. The Capitol building was redecorated with colorful banners addressing climate change and the need to discontinue filthy fossil fuel projects. “As the recent Exxon Mobil pipeline disaster has made clear, Governor Schweitzer is attempting to turn Montana into an extraction state, while at the same time publicly proclaiming his supposed support for clean energy, protecting the environment and building healthy communities. It’s one or the other. You can’t be clean and dirty at the same time,” according to Bozeman’s Erica Dossa, who also took part in the action.